Paradise Works booth at The Manchester Contemporary 2017. Image courtesy Stephen Iles. The following conversation is between Hilary Jack (Paradise Works) and Helena Kate Whittingham (VITRINE), which took place electronically in the weeks following The Manchester Contemporary 2017. Both Paradise Works and VITRINE were selected to participate in The Manchester contemporary 2017, and were invited by Corridor8 to discuss their organisations and participation in the fair as a whole. V: Perhaps we can start with describing who we chose to show at TMC? We presented a curated group booth of gallery artists, including new works on paper by Tim Etchells, Sam Porritt and Charlie Godet Thomas; new wall-relief works in wax by Jamie Fitzpatrick, and Wil Murray’s unique series of photographic sketches for ‘THE ONLYES POWER IS NO POWER’ series and sculptural ‘wobbly walking sticks’ from Charlie Godet Thomas. 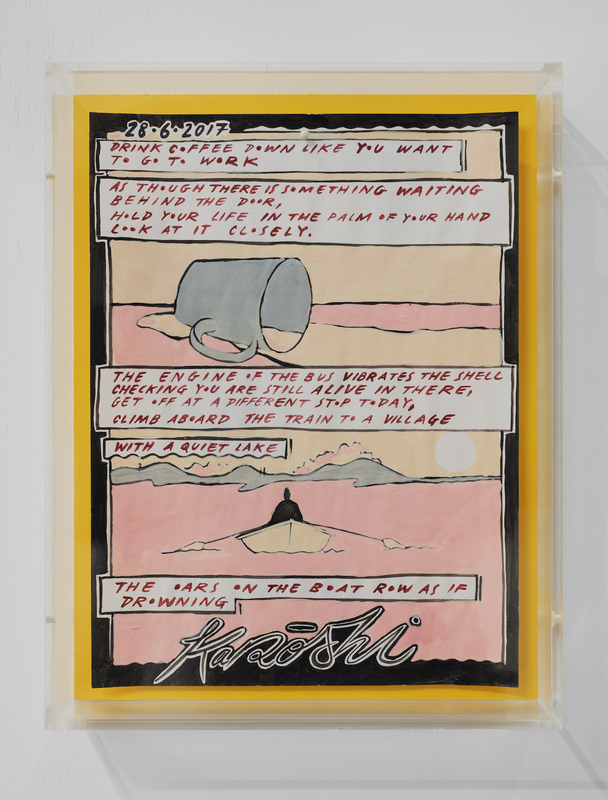 The booth surrounded themes of language, and drawing as a unifying device. PW: The show at TMC was curated by studio member Kieran Leach. Kieran had recently been selected for Launch Pad at Castlefield Gallery by Patricia Flemming Projects to curate a show Stick or Twist. This was an opportunity for him to expand his curatorial practice. He chose to show an intergenerational selection of artists from our membership at Paradise Works. The list included fairly recent graduates to artists with long standing careers – Jo Macgonigal, James Ackerley, Hilary Jack, Precious Innes, Robin Megannity, Richard Shields and Claire Tindale. This was a capsule selection from our inaugural show in our new gallery space at PW, The Politics of Paradise, which explored historic and contemporary notions of “paradise” and the utopian vision often attributed to artist communities. This was our first art fair and also the weekend of the Launch Party of our brand new studio and gallery Paradise Works. So, a really busy weekend for us and an opportunity to showcase our membership and promote our new studios and gallery. I imagine your focus was very different to ours. There are so many art fairs -What was your main motivation for showing at The Manchester Contemporary? VITRINE booth at The Manchester Contemporary 2017. Image courtesy VITRINE. V: VITRINE’s founding director Alys Williams has presented at The Manchester Contemporary for five years now, and believes strongly in the importance of the gallery’s links in the UK outside London. We have grown a network of collectors here, who follow our programme and maintain an active dialogue with Alys and our artists. 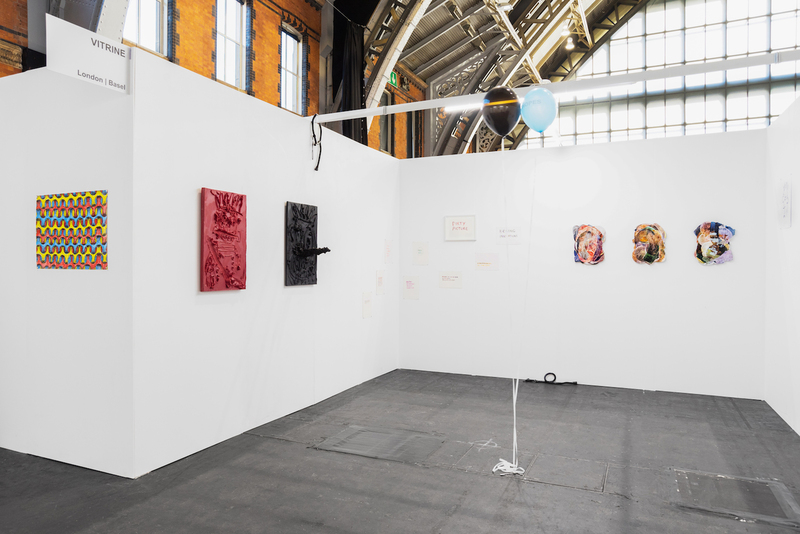 This is fruitful for the commercial gallery, even if budgets are often lower than at other international art fairs. The curatorial networks that have grown through our presence at The Manchester Contemporary are also valuable. An example is Clare Kenny’s recent solo exhibition Industrial Romantic the first of Mark Doyle’s new programme Contemporary Forward at Touchstones Museum, Rochdale. This was Kenny’s first UK institutional show and Rochdale is also her home town. A number of our represented artists have links to the North of England and want the opportunity to exhibit in the amazing regional galleries up here, so we feel it important for them to maintain and strength our links and conversations here, through projects such as The Manchester Contemporary. PW: That’s really interesting about the Manchester Contemporary, developing a collector base, networks and links with the north of England. We are keen to develop links across the UK and further afield with our new gallery space at Paradise Works, the inaugural show has been well received and we’re now looking forward to programming for 2018. As for the Manchester art scene its an interesting and shifting space at the moment. We have a new director at Manchester Art Gallery and The Whitworth Alistair Hudson who replaces Maria Balshaw, now director at Tate. The International 3 is soon to close its doors after twenty years as Paulette Terry Brien takes up her post as curator at The Grundy. The grass roots art scene continues to expand at a fast rate and we have joined a growing network of artists’ studios and artist-run and creative spaces on the Salford-Manchester border from Paper Gallery, PS Mirabel, to Hotbed Press, Caustic Coastal, Islington Mill and Walk the Plank.. This is as a result of a crisis in studio provision in the city centre of Manchester which has forced the closure of some studios and artist led spaces due to the sale of their buildings to regional developers and foreign investors. Our new studio group Paradise Works consists of members from eight artists studios evicted in the last seven months sometimes at very short notice. NySpace, The Penthouse, Red Door Studios, Hotspur, Rogue Artists Studios and other smaller set ups. Other spaces of note hanging on close to Manchester city centre are Collar in Ancoats and Title Date Duration on the Manchester Old Trafford side of the city. The largest studio group, Rogue Artists’ Studios have now moved into new premises in a council owned decommissioned old school in Openshaw a few miles from the centre. As for representing artists there isn’t really much of a critically engaged commercial gallery scene. At Paradise Works we are starting to build relationships with collectors and we are planning to take part in art fairs in the UK and Europe, representing artists from our own membership. Our first foray into this world being The Manchester Contemporary. Any advice on building networks and taking part in art fairs? Robin Megannity, ‘Bicep’ (2017). Image courtesy Stephen Iles. V: That all sounds very interesting and a healthy art scene – I will have to come to Manchester more often! Its also great to hear about Alistair moving to Manchester and the Whitworth! I am from Middlesbrough and I am so proud of what he has done for MIMA. This question of advice might need a longer answer than this interview allows for, but the key is communication (between artists, institutions, curators, and collectors) and time. In regards art fairs, just be careful; think about what it is you want to achieve from a fair, whether you have the money to invest in it without an expected return, and whether it is the right route for you and the artist(s). Fairs are dominant at this moment in the art world, but they are not the only way to create an international network. What’s upcoming in the new year for Paradise Works? PW: Great advice. And yes please come back soon! It would be great if we could collaborate in some way and we would love to visit you in London. As for future events at PW, studio member Chris Paul Daniels has put together a great film screening in collaboration with HOME in our gallery – Schools of Change: Artists Films opens on 30 November quickly followed by The Penthouse (AKA Rosanne Robertson and Debbie Sharp) presenting a screening of HIVIdeo by Balaclava for Worlds Aids Day. Over Christmas we will have a break and a period of reflection – its been such a busy seven months since we moved into the building and the temptation is to crawl into our individual studios and shut the doors – but we do want to be active in conversations with city planners, developers and Arts Council England about cultural planning in the city – and of course we’re excited to start programming our gallery space. Last question – what plans for VITRINE?? Charlie Godet Thomas, ‘Illuminated Manuscript’ (2017). Image courtesy VITRINE. 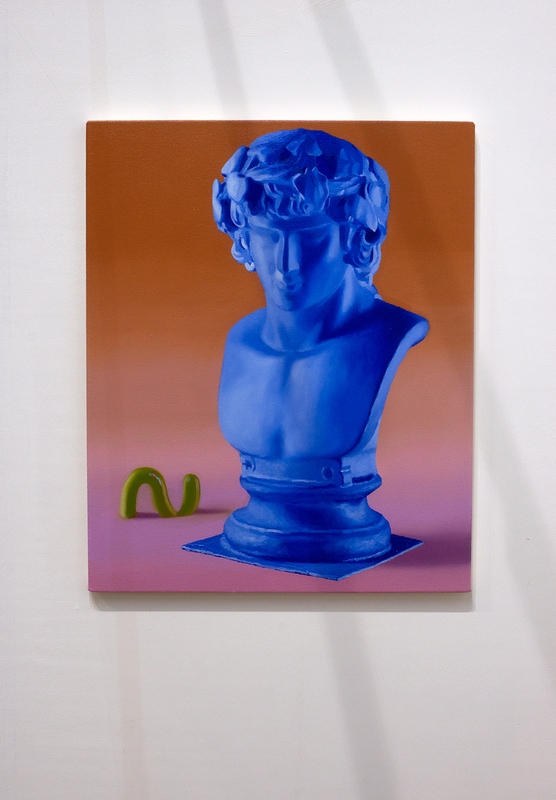 V: We have just come back from Artissima where we presented a solo booth of Edwin Burdis’ work, who we represent. Burdis explores a unique and extravagant fusion between art, music and sub-cultural references, working across sound, sculpture, painting, drawing and performance. In his current practice he is focused on the production of an imagined opera, titled ‘Dry Stone Wall PA’ and set in Wales (where he has lived and worked since 2015). In his current and forthcoming exhibitions – including this Artissima booth – he creates works that are born from this factory for producing the opera, which include: an unusual cast of characters, dancers, singers, musicians, countryside landscapes, countryside architecture, musical instruments, a car mechanics and a car engine; depicting various themes reflecting on contemporary Britain. 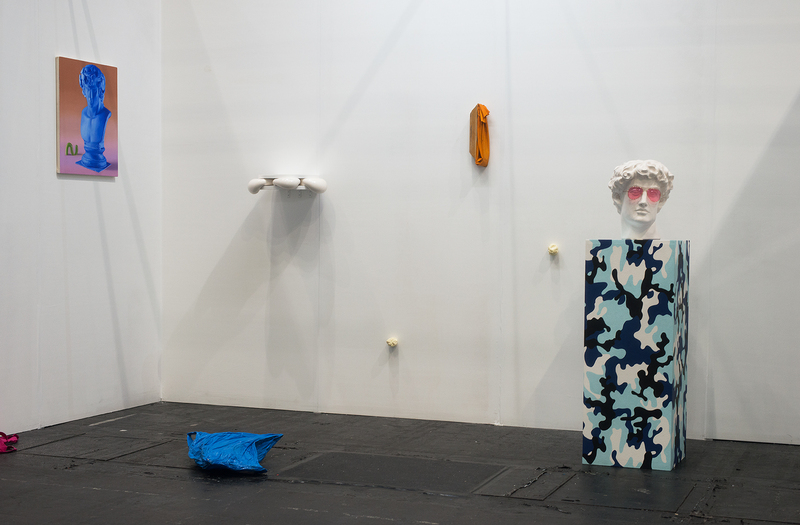 For Artissima, these elements became an assemble of sculptures, maquette, paintings, prints and wallpaper. Upcoming at VITRINE Basel, We have Maya Rochat’s first solo exhibition in Basel and with the gallery. The exhibition challenges the notion of traditional photography by playing with invented chemical processes, layered and multimedia installations, which will evolve during the time of the exhibition. In London, we currently have THE ONLYES POWER IS NO POWER, Wil Murray’s third solo exhibition with the gallery, presenting a new large-scale print series and exploring transformative mechanisms within the photographic process. The exhibition runs until 2 January. We then have have a solo exhibition of Alfie Strong opening on 11 January. The Manchester Contemporary 2017, Manchester Central, Manchester. 27 – 29 October 2017. More information about Paradise Works can be found here. More information about VITRINE can be found here.